12 of you have decided to go on the Poás Volcano tour Saturday morning! The Poas Volcano, a National Park, reaches to the height of 2,300 meters above sea level. 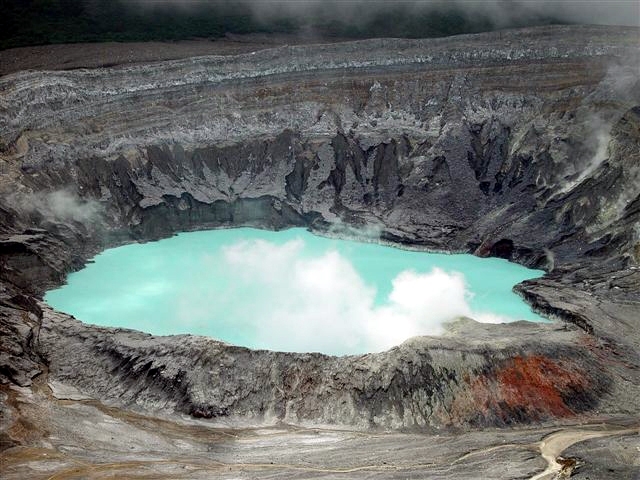 It is an active volcano with a beautiful blue crater lake at its summit, located amidst alpine cloud forest. As we ascend, there is a noticeable change in temperature and vegetation, preparing us for the pleasure of the exuberant cloud forest of the Poas. At the Volcano we will have time to observe the impressive main active crater with its sulfur fumaroles and the second dormant crater. Time permitting you will visit a coffee estate, where your guide will explain a bit about the coffee crop, its cycle and its importance to Costa Rica. Your guide will be the highly professional freelance tour guide Gustavo Leon. We recommend you bring: light jacket, walking shoes, binoculars and camera. Pick up from hotel: 8:00 am. Return - about 1:00 pm. Cost: $45 per person, and includes: Transportation, a bilingual driver/guide, entrance fee to the National Park. Please prepay for the trip on the right - if you cannot do this you can pay with cash when you arrive. Bring: comfortable walking shoes (tennis or hiking) and a windbreaker or light rain jacket.